Hi all. Today will be a bit of the gaming side since I did complete a few more games while binging old shows. This game took me about a month to complete, because I keep getting side tracked with side quests and constantly getting lost. This game was ported from the PS4, in terms of graphics capabilities, but the game code is still very PS3-esque, looking very similar to Tales of Berseria. Are the two of them long lost brothers? The moment I started to do my first combat sequence, I got glued to the game. I like how destructive and goofy the fighting style is. And they did a great job integrating the overly dramatic fighting techniques with cutscenes in-between. Story wise, the pacing can be rather slow, but if you ever feel bored of progressing, you can just play sidequests and mini games to get entertained, get more in-game currency and upgrade your skills. Storyline can be rather hilarious, but when things get serious, it gets really intense. The plot twists are very surprising. I didn’t expect a lot of the things happening, and always ending up feeling mindblown after every chapter. A lot of boss fights which made the game intense around every few chapters. And because it’s a hack-and-slash esque game, I am constantly smashing my controller buttons. The final climax was intense, so intense that I keep ending up with game overs. The ending was pretty dramatic, and I felt a little sad, for Makoto and Goro. I can understand where Goro is coming from, but giving up on a cute and sweet girl like her, I feel the extreme bitterness. Overall this is not a short game, and it’s not long either, it feels just right. But you can make it a really long game by just completing the sidequests, or constant grinding mini-games. What I wish is that they could squeeze more content per chapter, because I find myself clearing a chapter in under an hour. The good thing is we get PS4-level graphics, actually we can go beyond that. Somethings like shadows, textures, AA can be toggled to get even better graphics than the PS4, but one thing I really want to nitpick is render/draw distance. We do get to toggle the distance, but even using max settings, you still get pop ins at a rather close distance. I wish they could let the game run wild and let it render everything. The graphics settings looks rather simple, but straightforward. But some settings are rather badly optimized. Shadow setting performance gap is one example. Maxing the settings with midrange hardware while achieving 1080p60 is possible, despite some weird optimization problems. But with max or minimum settings, the game looks incredible. The character skins, the characters combat sequences, the street backgrounds everything, just looks great. Overall it’s pretty decently optimized. Physics are great, the destruction looks rather realistic, not completely, but looks great enough. There are moments where cutscenes are playing a video and they made it looked incredibly different from the game, like they look a lot better than the game in max settings. It can throw the pacing off sometimes, but I appreciate the art so I’m fine with it. How great it looked you ask? To the point the characters using motion capture to interact and the characters suddenly grew pores on their faces. It’s that detailed. The combat is great, I love the throw punches and even throw items around me. Sometimes even we go B-Boy and fight enemies. The UI is pretty foolproof. Shopping is can be quite a joy. But there is one major flaw at launch. No chapter-basis auto-save. They added it in a later update, but at launch, it was just irritating and frustrating. With the constant fear for game crashes, I find myself looking for public phones to save my game. It has happened more than 5 times where my game crashes before I didn’t save after every chapter and lost a lot of content. But the new update came and fixed things, so that is out of the way. Otherwise, the game is pretty fool proof. Another thing I love is that this game supports PS4 controller mapping ON PC. Most PC only supports Xbox mapping, but this game loves PS4, so we get the mapping. It’s wonderful. It keeps the mood going during combat scenes, and also blends with the ambience during rather romantic cutscenes. The cast is pretty lit for me. Shibata Hidekatsu, Iura Arata, Nakano Hideo, Ugaki Hidenari, Tsuru Hiromi, Egawa Hiseo, Ozawa Hitoshi, Otsuka Hochu, Konishi Katsuyuki, Nakaya Kazuhiro, Tanaka Kazunari, Nakai Kazuya, Fujiwara Keiji, Sawashiro Miyuki, Kusumi Naoki, Takeuchi Riki, Koyama Rikiya, Nakao Ryohei, Tsurumi Shingo, Sakuya Shunsuke, Kuroda Takaya, Watari Tetsuya, Okawa Toru. Most of the character models are modeled after their voice actors, but some are not. The cast did their jobs nicely, giving a lot of bass in their voice to ring my ears. I guess my favourite guy in the game have to be Awano Hiroki, modeled after Takeuchi Riki. It’s just wonderful, I love how perfect they modeled after him. Shibusawa Keiji, modeled after Nakano Hideo, is close 2nd. Reina, modeled after Tsuru Hiromi, is an extremely close 3rd. Makoto gets cutest girl award though. Highly recommended to play, especially on PC. You get better graphics than PS4, even better than the Pro. It’s a great title to join in on the Yakuza universe. 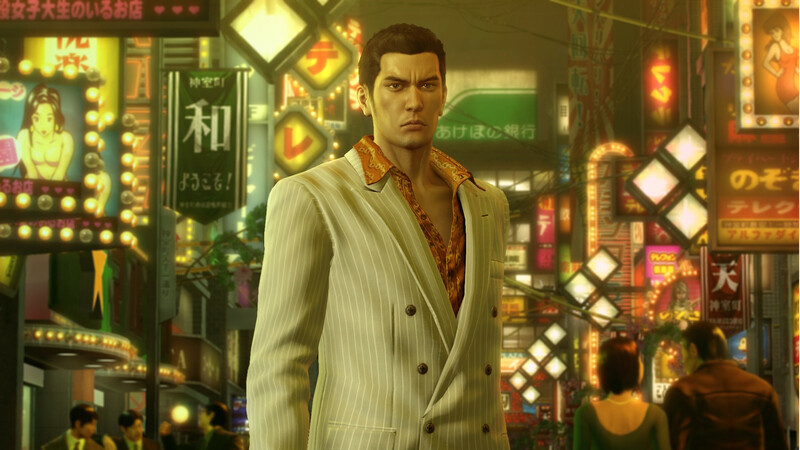 I can’t wait for Kiwami coming on PC and I will definitely be playing it. I will be watching Tonari no Kaibutsu-kun live action tomorrow, so I can’t wait. Review will be out on the same day. So see you all then.